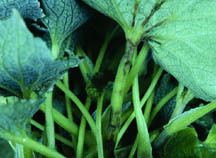 Tospovirus is a virus family that includes Impatiens Necrotic Spot Virus (INSV) and Tomato Spotted Wilt Virus (TSWV). Both strains may occur in greenhouses as well as in vegetables. The host ranges of the two viruses overlap and are extensive. Almost all greenhouse crops are susceptible except for poinsettias and roses. Thrips transmit both types of viruses in greenhouse and field crops. Seven species of thrips are vectors for TSWV, but the only confirmed vector for INSV is Western flower thrips (Frankliniella occidentalis). TSWV is a problem mostly on vegetable plants such as tomatoes and peppers, while INSV is the predominant tospovirus found in ornamentals More than 600 plant species are known to be susceptible (see below for a partial listing). These viruses are spread from plant to plant in greenhouses by the Western flower thrips. The original name of TSWV was derived from the symptoms (spotting followed by wilt) that develop on tomato. Similarly, the original name of INSV was derived from symptoms (necrotic ringspots) on Impatiens. On other hosts, ringspots, purple to black lesions on leaves and stems, flower color breaking, stunting, death of terminals, and wilt may occur. The stage of growth can also influence symptom development. For many hosts, symptoms are not well known or are not described. However, in some commonly infected crops, symptoms can be diagnostic. 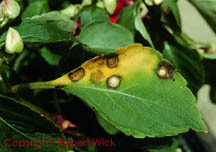 Gloxinias infected as young plants develop necrosis of the central leaves, resulting in collapse. Older Gloxinias develop necrotic ringspots on the foliage, as well as necrosis along the veins. 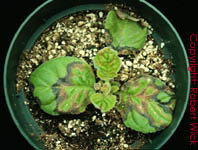 Cineraria develops chlorotic ringspots and/or mottling on the upper leaf surface, and purple to black lesions on the veins underneath. On exacum, the virus causes tan to dark brown cankers on stems. Reiger begonias develop necrotic ringspots, mosaic, and necrosis of the leaf veins. Symptoms on Impatiens and New Guinea impatiens include stunting, leaf distortion and blackened spots or rings on foliage and stems. In some cases, terminals will die and the entire plant may collapse. As with other virus diseases infected plants may remain symptomless for a period of time. In Massachusetts, the virus has only been noted on pepper and tomato. On pepper the foliage becomes distorted and the fruit develop circular rings that are slightly indented into the skin. On tomato, foliage becomes spotted and blackened particularly on the inner leaflets toward the top of the plant. The growing point may also become necrotic and the whole plant may wilt. Fruit symptoms are variable. Small necrotic spots to large circular blotches may develop. Both viruses are transmitted by vegetative propagation of infected plant material and by the feeding activity of certain species of thrips. In greenhouses, the most important vector is considered to be the western flower thrips (WFT), Frankliniella occidentalis. The virus is associated with thrips in a persistent manner. Larvae become viruliferous after feeding about 30 minutes on an infected plant. After a latent period lasting 3 to 18 days, the thrips can infect new plants after feeding for 5 to 10 minutes. During feeding, saliva is injected into the plant cell and the contents withdrawn. When tospoviruses are present in the saliva, these are transmitted to the plant during the feeding process in as little as 15-30 minutes. Only the two larval instars of WFT can acquire the virus. Adult WFT do not acquire the virus from tospovirus-infected plants because tospoviruses pass right through the gut and do not enter the salivary fluid. Once thrips acquire INSV or TSWV, virus multiplies within the salivary glands and other tissues of the thrips and is later transmitted to new plants by the feeding of the infected thrips after it has reached the adult stage. Adults however, do not transmit the virus to their young and there is no transmission from adult to egg. Overlapping generations of thrips within a greenhouse may result in continuous virus transmission. In greenhouses the viruses can be perpetuated through successive crops and weeds resulting in losses year-round. The disease has not been observed to spread significantly in field-planted vegetable crops in Massachusetts. On-site test kits can be used to determine whether or not tospoviruses are present in greenhouse plants. If a plant is suspected of being infected with a tospovirus because the plant is showing symptoms of virus infection, a tissue sample can be collected from those parts of the plant showing symptoms. Even, when plants are systemically infected, tospoviruses do not spread evenly throughout the plant, so careful selection of tissues is crucial to the success of the test. Collect a sample from the part of the plant showing symptoms, including green or chlorotic tissues adjacent to the necrotic area. Thrips can also be collected from sticky traps and tested using the test kits. Agdia manufacture test kits available for on-site testing. Separate kits are available for testing for INSV and TSWV. Another option for detecting tospoviruses is to send a plant sample to a plant disease diagnostic clinic. 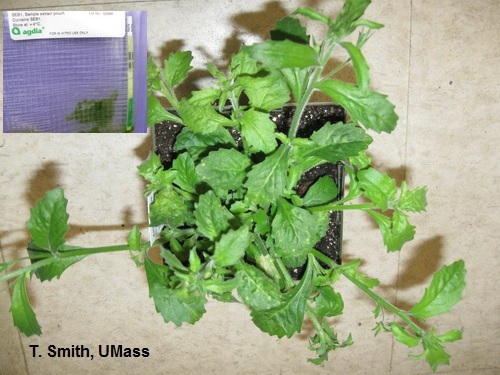 Samples may be sent to the University of Massachusetts Plant Disease Diagnostic Lab, 101 University Drive, UMass, Amherst, MA 01003 (a fee will be charged). One problem with testing for viruses is that some host plant species do not express TSWV or INSV symptoms until long after the initial infection. Cyclamen, for example, can show no symptoms for up to two months after infection. Elimination of infected plant material and WFTs are the most important management practices. Newly-acquired plant shipments should be inspected for evidence of thrips and symptoms of virus before being introduced into the greenhouse. Symptomatic plants should be discarded or isolated and the supplier should be notified after laboratory confirmation of the disease. Since various weed species can harbor the viruses, thorough weed control is important. If possible, keep vegetatively propagated plants isolated from those produced from seed. Do not grow vegetable transplants in the same greenhouse with susceptible ornamentals. Thrips populations should be monitored with sticky traps. Since only a small number of viruliferous thrips are necessary to start an epidemic, total eradication of WFT should be the goal. L.B. Stack New England Greenhouse Floriculture Guide, A Management Guide for Insects, Diseases, Weeds and Growth Regulators. New England Floriculture Inc. Prepared by Dr. Robert L. Wick, Stockbridge School, Fernald Hall, Room 111, University of Massachusetts, Amherst MA 01003.